But I have done some work! My niece, Brita, came for a week's visit to help me get some things done. Our main job was getting two rows of raspberries and the weeds in between dug up and cleaned out and the berries replanted. We got that done in two days and this is the best this garden has looked in probably over 10 years! We also helped my hubby get the pine T&G up on the ceiling in the garage. It was definitely easier putting up 16' boards with three people! With this up we were able to order our new garage door. Since we got the important work done I took Brita and her big sister, Katie, to Seattle to watch the Blue Angels doing some practice for the air show over the Seafair hydroplane races. We were sitting dangling our feet in Lake Washington close to the pits where the boats are put in the water for racing and I posted on Facebook that we were sitting there and a guy I went to high school with and now works security in the pits came out and invited us in for a tour of the pits. That was the first time I had ever been in the pits though I lived within a few miles of the race course my whole childhood. The Oh Boy! 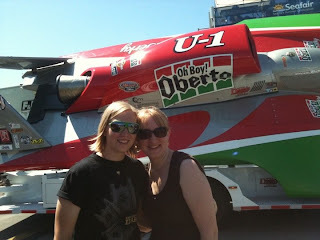 Oberto was coming into the pits and I snapped this shot of the girls as it went by. It turns out it was the Oberto that won on Sunday! We had a lot of fun and Brita did get a top quilted while she was here and finished the bindings on it and another quilt she brought with her. Katie and I managed to each get two blocks done for our round robin. We are both now done with all our obligations and it looks like the reveal will be in October sometime. Today I started painting all the new construction on the outside of the garage and got the first coat of primer on. After resting up for a bit I did get a back made for the Geese Atop Your Cabin quilt top that I made and got it basted so maybe I will get it quilted tomorrow after getting the next coat of primer done. I need to get this one finished this week as it will be hanging on the stage at our local Bluegrass Festival on the 20th.